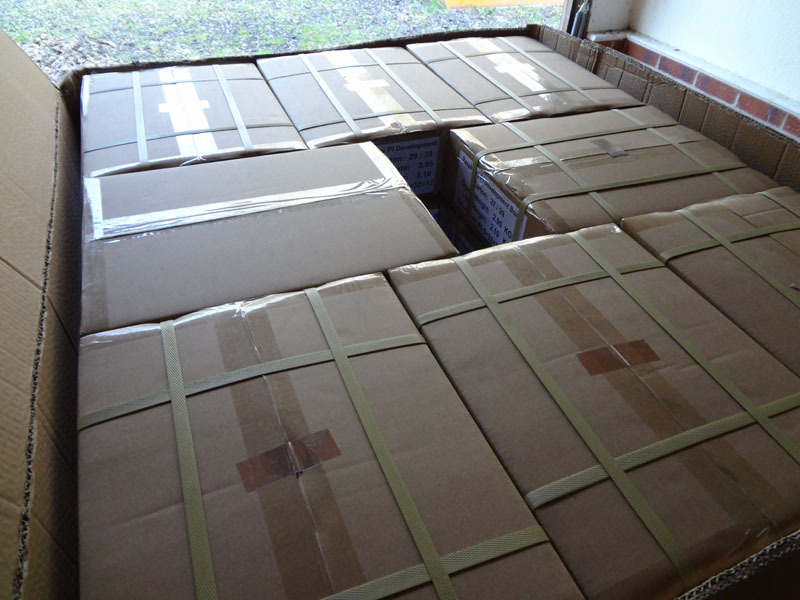 Back in February 2012, we produced the first 2000 Raspberry Pis in China (UK manufacturing came later), and they were delivered to Jack’s garage in March, from where Eben and I split them into two lots of 1000, stuck them in the boot of our car, and drove them to Farnell and RS Components’ headquarters. 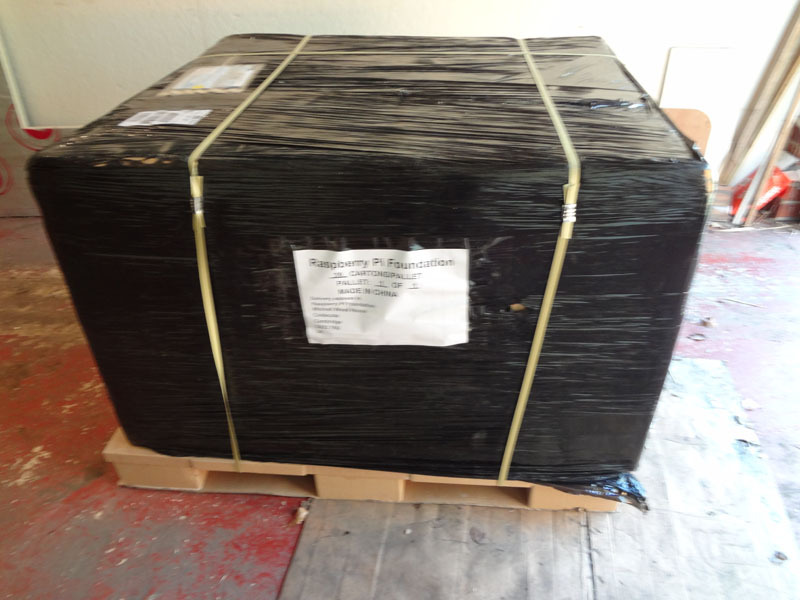 The Pis were in boxes of 50, stacked together to make a pallet of 2000. We took the web’s first Raspberry Pi unboxing picture. 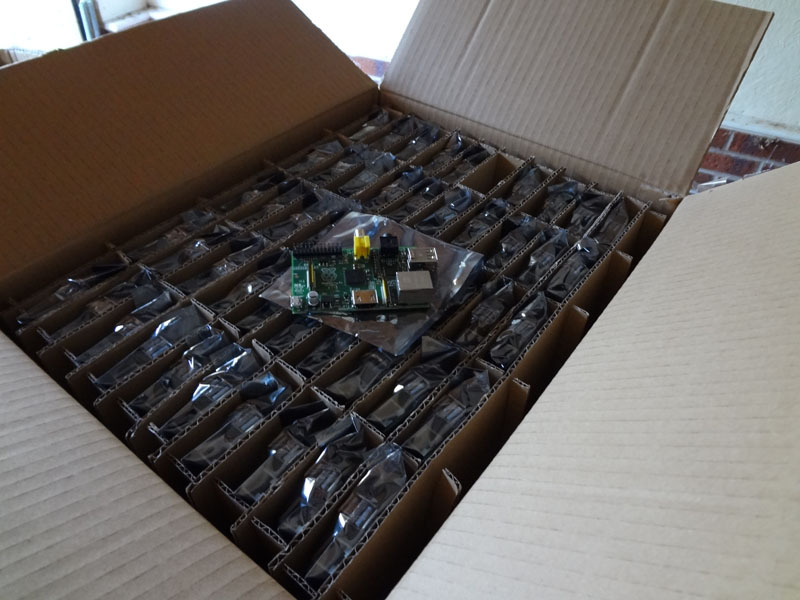 And on getting the news about the 2,000,000th Pi at the end of last week, it struck us that every single Raspberry Pi in that pallet represents 1000 of the Raspberry Pis that are spread around the world today. We never thought we’d be where we are today when we started this journey: it’s down to you, our amazing community, and we’re very, very lucky to have you. Thanks! Many congratulations for reaching this stunning figure! Well done and massive thanks for letting us be part of something so great. 10 million here we come! It looks as if the Pi production will go on till eternity. It’s such an amazing device. Especially for people who tinker around with the GPIO’s. Absoloutley incredible! Congratulations on being such a major industry leader on this front ;-)! Congratulatons! How many BBC Micros were sold again? ^ Got a little way to go in order to beat that target! I do hope the Pi beats 5 million this next year. But that is exactly the right comparison. The beeb and the spectrum were wonderful machines in every meaning of the phrase. …although, you’ll know when you’re on the way down – when Emperor Lord Sir Sugar tries to buy you out!! I still maintain that the Beeb is the best computer not on the market. I hope the Pi never takes this crown! On the contrary…surely the fact that sales are stronger than ever, shows that the product is exactly what the customer wants. Congratulations guys..Vive la revolution!! Wow only 1.5M BBC’s I would have said that there would have been way more. Just shows how great the 2M figure is. Well done to you all. BBC Micros were mainly in schools, as I remember at the time. Pi OS? There’s a thought! On course to beat the C64! The BBC micro was an expensive device, so not many people bought more than one. The Pi is different in that respect – I’ve bought five, others even more. Oh, and congratulations. Here’s to the next 2M. I am the proud owners of one of those first 2000 and what made it even more special because I took the day off on launch day and battled the website to get my order in. I then came home one evening months later to see a picture of Liz and Eben delivering the first batch to Farnell on the website and as I was reading it an email came through saying “Your order has been dispatched” the wait nearly killed me but it was worth it. I now have 4 doing a multitude of tasks and have even managed to introduce them at work as environment monitors for our server room and workshop. Thanks for the Hours/Months of fun they have given me. Congrats to the folk at Raspberry Pi for 2Mth sale. It is such a good thing Raspberry Pi, and I love the two I have on my desk! Congratulations! Best piece of hardware I’ve bought in a long long time. Unattended, unexpected and really incredible. Hope, you’ll get much farther than that! I suggest that when you get to 5 million you make a special edition, golden, Ras Pi :) By ten million it can be a Platinum one :) It may even happen in 2014! Rather than a vanity show I’d rather wish for PiOS v1.0 – a complete desktop operating system with graphics acceleration and maybe Flash-Friendly File System (F2FS). Other ideas, people? :D What would you want from Raspbian or PiOS? More speed and more simplicity – less choices, a consistent look and feel for the ‘standard’ distro? We love them. Thanks for everything. My wife had (she gave to our daughter) one of the tribbles actually used in that episode…. Eben looks good with Moustache!!! The Register has picked up this news, and they drew an interesting (if unsurprising) conclusion about the state of the RPF’s finances. Their ( the Register’s ) conclusion was about sales figures. RPF’s attention were arrested by manufacturing figures. The same Register journo’s recent headlines include “We’ve found it – the ULTIMATE man-cave accessory” (a toolchest with built in fridge and TV) and “Oh Mr Darcy! You’re PRESSING MY BUTTONS”. Woodward and Bernstein can probably sleep easy. I did in fact buy one in that time frame. Now that there are 2 million, it would be a good time (imho) to start a reference table that shows definitively how to tell each version from the others. Some projects seem to have hardware/software version dependencies. For example, the BrickPi has mounting holes that match up with later versions of the Raspberry Pi. IIRC, the one millionth Spectrum made at the Timex Factory in Dundee was painted gold. Maybe the 3,141,592th Raspberry Pi should recieve the same treatment. When I was a kid, there was a public service announcement (PSA) “commercial” that was pointing out how small a single drop of water is, but if you put enough of them together, you can eventually fill an ocean. Congratulations on turning a puddle into a pond, a pond into a lake, a lake into a bay, a bay into a sea, and are well on the way to creating an entire ocean! Like an ocean or a racing sailboat, the one-design of the Pi models means that once you’ve learned to navigate and operate with one, you can do it with any of them, anywhere in the world (after adjusting the i18n -internationali(s/z)ation – settings). I can’t think of many other platforms on which that’s as feasible. Well done Eben and Liz! It’s been great seeing what you’ve been up to take off since we last saw you. Hello you two! Do drop us a mail; it’d be lovely to hear what you’re up to at the moment! The first Pis were, but they’ve been made in the UK for a long time now. There is still a Chinese manufacturer making red Raspberry Pis, but those are only for the Chinese market. I just knew you could do it guys! Does the 2 million include the red ones for the Chinese market, or are they additional to that figure? Those are additional – we only get figures for those annually. Just goes to confirm then – what a fantastic achievement – the naysayers will be eating craw! I bought my PI on Oct 27th glad to be a part of it! I know this is going to really unlikely but will there ever be a statistical map showing the spread of the Raspberry Pis? It only has a small number of the total number of Raspberry Pis as you need to register your Pi for it to be included (which is now available through raspi-config), but it gives a rough idea of the distribution of Pis around the world. Your two millionth sale couldn’t be the one you gave to Prince Andrew. Looks like British made computers are back on the map! I can’t wait for Wayland to be ready. Pi desktops (hell, even mini gaming machines, open arena is a pretty decent and Quake 3 is awesome) will be amazing. Thanks Edwin! Progress so far is looking good; we don’t have a firm date for Wayland on the desktop yet, but progress is looking great and we think you’ll really enjoy it. You’ve got a lot of experience now, could you design a new product intended for the hobby market, more powerful/expensive and use the profits for promoting education ? I’d rather buy a $50-$80 product from you than any other maker on the market. I would love a device that has the same sort of internals as a contemporary high-end mobile. Dual or Quad core cpu/gpu and 1-2GB or RAM. Awesome creation pls just don´t send the production to China, no more china crap. My first Pi was a chinese one and worked perfectly well until it got struck by lightning. This is a great achievement. Congratulations! Is there some statistics you can provide which show what these 2 million are used for? I’m not sure I’ve registered my intent for mine, but I’d be sad to see a majority of these collecting dust in some school storage facility. Perhaps it would be cool if the OS packages could “call home” with their serial numbers and info to help with that. how many records did this figure break??? Congrats on this pleasantly over-sized achievement! Especially since this seems to be just the beginning. But more importantly Congratulations on achieving the goal you set out to achieve of getting a device in to the hands of 10,000 kids that might inspire them to be interested in computing. I think when the 1.75m was announced Eben mentioned that ~300,000 are in the hands of kids. Even if you forget the other 1,700,000 sold gorwn up kids this is already 3,000% over the goal that started it all. I’d be shocked if in amongst those 300,000 there weren’t at least 10,000 kids who have found a new love for computing and this is even before the serious formal education work gets into gear..
We think we can actually start to revise the 20%-going-to-kids figure upwards as of the start of this school term; we have seen a very large number of schools buying classroom sets (of varying sizes – one kid I have spoken to goes to a school where there are five for the class, another where there’s one for every child). We need to do some maths in a few months when we have a clearer idea of how many schools are tooling up! After the maths a rastrack of schools and number of Pi’s per class/hours of usage per week, may allow parents and their children to make informed choices together/avoid a Pi desert. I feel so proud of what you and your team have done. I have followed the pi since the beginning of 2012 and like many others had waited as the back-order list was fulfilled over a 6 week period, and since then had ordered three more as I am always finding a new project that I want to create and the pi is just so versatile, powerful, and fun to work with that I run out of time way before my imagination wears out. I have not commented on here before, but I really felt such genuine admiration for what you have accomplished that I was compelled to voice it. By your example, you have inspired me to continue tinkering, experimenting, and chasing my dreams, and that is quite an impressive thing to do for someone, so from the bottom (and top) of my heart, thank-you for your heard work, tenacity, genius, and sleepless nights. From halfway around the world, in sunny Southern California, Dan Gleason. Sony sold a million PS4’s in the first 24 hours of it’s launch. I love the fact that they also make the raspberry pi. Which production line will last the longest? So 2* (the weight of a PI in Grams) is the total weight in tons of PI’s made..
A silly sum maybe, but what a visualisation. Is there any data regarding units sold over time, would be interesting to plot the rise of pi. I also want to work out if I should ensure my Pi ownership should follow the curve. I love that they are British …I have two RPis ….one Pi Hub … Makes me want to buy more from local industry because the quality is spot on. KEEP GOING!! #’s 2 000 000 and 2 000 001? Congratulations, and well done. I agree with the racing sailboat analogy — one design makes for great racing and lots of expertise! Stick with it, RPF! Congratulations and here’s to the next million! XBMC media center on Raspberry Pi for everyone! Congratulations for the amazing job you do. Was bought my Pi by a friend. Didn’t really take much interest until then. Think I need atleast another 3 for various ideas I have. I’m sure you’ll be up to 5 million by the end of next year at this rate!